We knew it would be too good to be true. Spending a hurricane season in Florida without dealing with a tropical system. And along comes tropical storm, soon to be hurricane, Isaac. This will make for 17 named storms we have had to deal with living on our two most recent boats - 16 on Sea Trek and now our first on Beach House. To say we're practiced at preparation is an understatement. 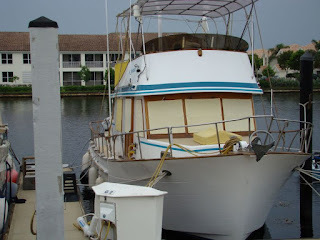 Much of what we did to prepare Sea Trek (read about it here. ), we have also done to prepare Beach House for Issac as it approaches us. You can see the projected path of Issac and all other storms in our storm tracking widget in the left column of the blog. As of 11 A.M. this morning, the outermost bands are hitting us and the rain and winds are picking up. The anticipated winds will be coming from the northeast initially and switch to the southeast, then south. 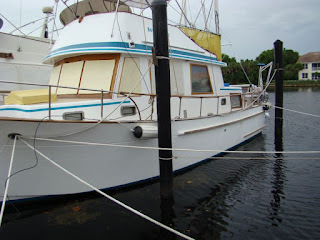 That will put the heaviest winds on our stern and then switch to our port beam and blow steadily for at least two days. They are now expected to be at least tropical storm force with gusts to hurricane force. Docklines are our first line of defense, and placement is important to keeping the boat off the dock and pilings. 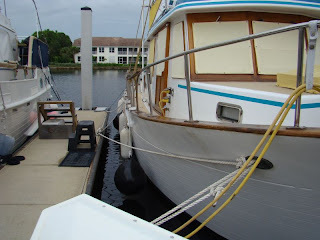 Several good, sturdy spring lines are set up to keep us from getting pushed into the dock with the wind astern. It's always been our practice to use over-sized docklines at all times, so getting different lines for storm conditions is not necessary. But we do double and even triple up on lines depending on how strong we expect the storm to be. We always prepare for the worst possible conditions. 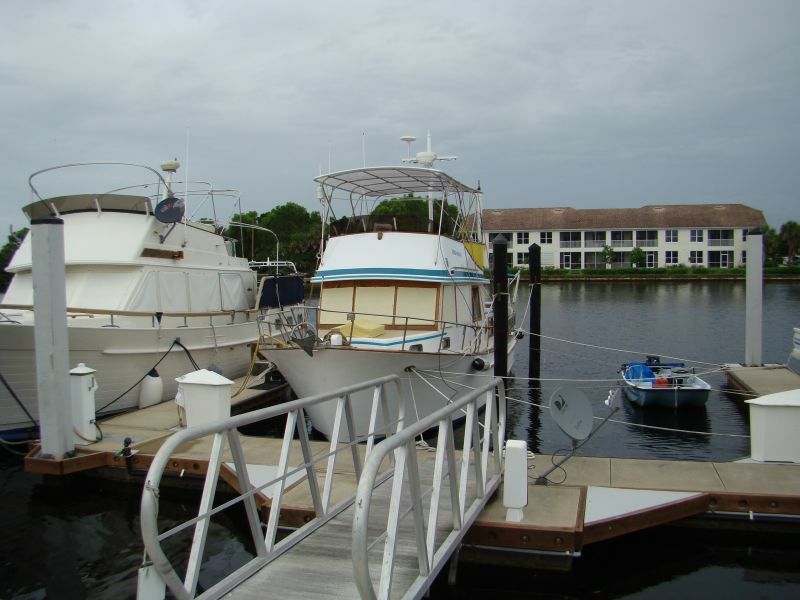 Our docks are floating docks so they will rise and fall with the storm surge, but we still add lots of well-placed fenders. Next we have added lines in anticipation of the strong southerly winds that will occur as the storm passes just west of us. 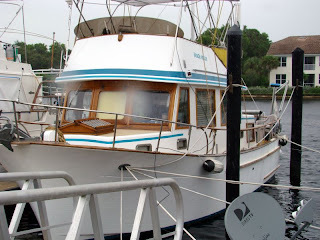 Fortunately for us, the houseboat that was in the slip next to us was moved, and this gives us some breathing room and allows for longer docklines spread out like a spider web. This is always the best tactic if possible. A couple of fenders are also in place to protect us against a couple of pilings. 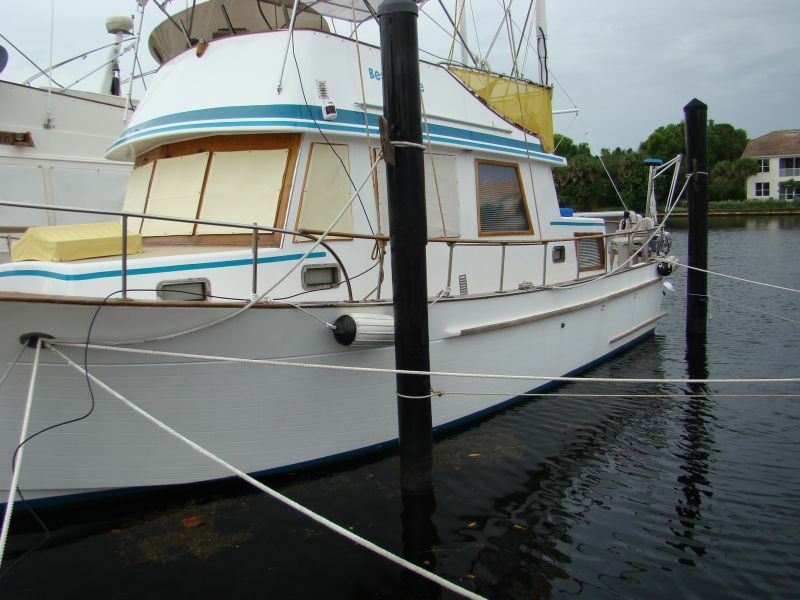 Our neighbor has tied their skiff in the empty slip under our docklines. A big concern for us is our new hardtop over the flybridge. 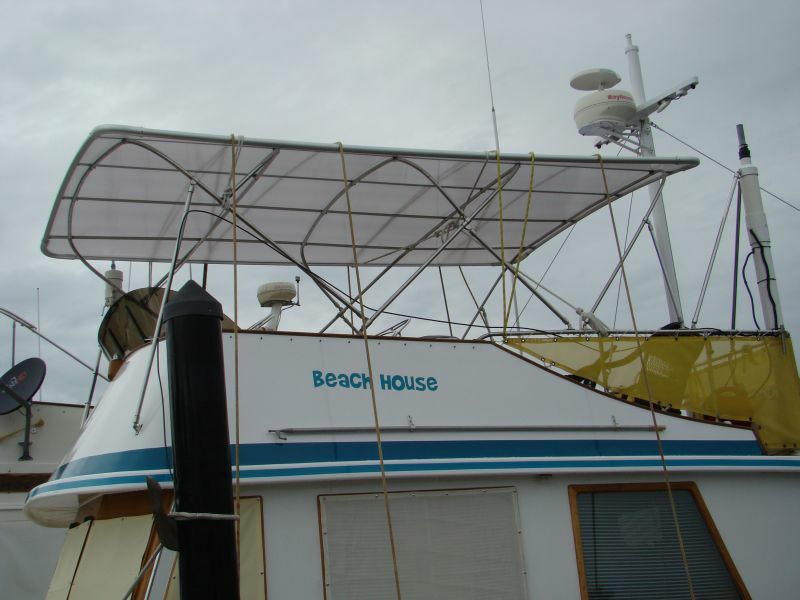 The manufacturer assures us that it can handle most storm conditions but cautions us that the weak link is the attachment point for the original stainless steel bimini bows to which the hardtop is attached. Based on that information and the inability to remove it without major assistance, we have tied it down to the upper flybridge rails and ran several lines over the top and down to the lower handrail stanchions for extra security. Time will tell how well this works for us. At this point the boat looks like some mutant spiders have crawled out of the Everglades and tried to entrap us in their web. This is a good reminder that we can't have too many lines aboard and they should all be of more than adequate strength. It's also a good reminder of why we carry at least two good sets of docklines at all times. 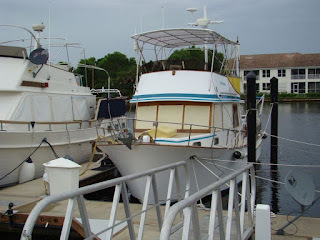 Everything that we can possibly remove has been taken off the decks and stowed away inside the boat or somewhere ashore. Covers have been placed over the seats in the flybridge and lashed down so they won't get blown off. 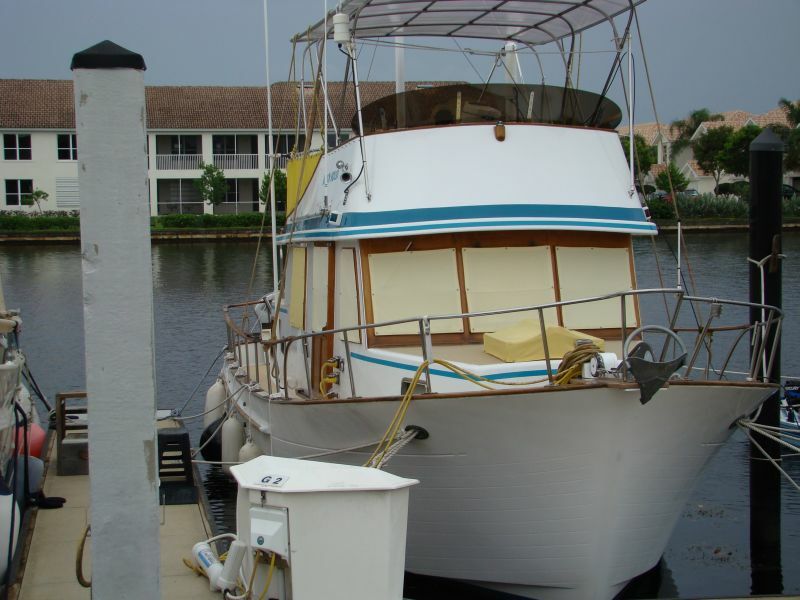 The flybridge seats are large storage lockers with lots of tools, etc. in them. Heavy wind-blown rain can work its way under the seats and get everything inside wet if not covered. We covered the seats with small plastic tarps, put the regular seat covers over the tarps, then tied lines around the bottoms to keep it all in place. Our final prep this morning as the winds starting picking up was to remove the last of the canvas covers off the windows. These can blow loose and the snaps can do damage to the wood and paint in 50- to 60-mile an hour winds. Our water tanks are full and the holding tank has been emptied. We have plenty of gas for our Honda portable generator. We're taking bets around the marina on how soon the power will go out. The fridge is stocked and the cars are full of gas if needed. The current forecast moves the storm a bit to the west as it passes and that will help. But with these storms, they don't always listen to the National Weather Service and prefer to do as they please. So once again, we have prepared for the worst, but will hope for the best. Our best scenario would be to have done all of this preparation for nothing. That really wouldn't make us feel bad. We'll post back after it's all over to report the results. Nice job on your prep. Lived in Nantucket, kept a boat there over the winter also. Would have 70-80 mph winds come up unannounced. 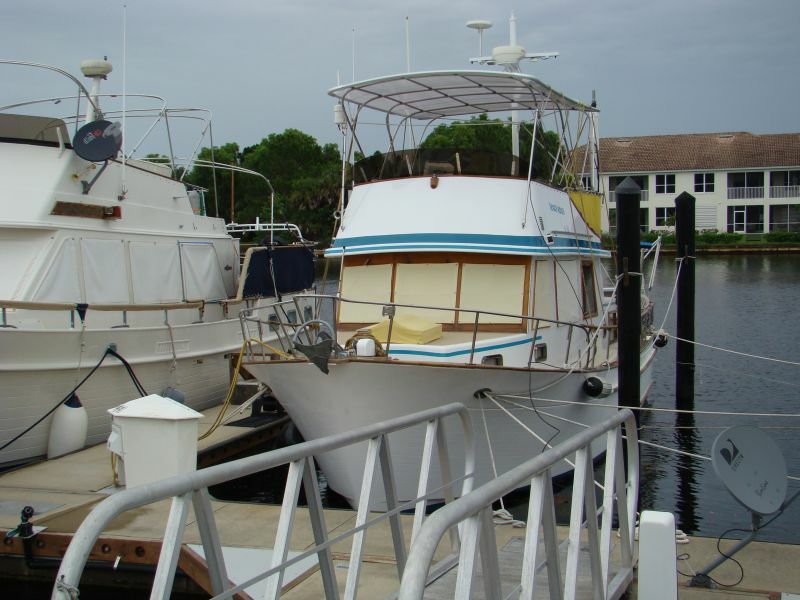 Most boats that break away have weak dock lines. You have done well, and I wish for your safe riding out....Roy Hansen, lurker.